This post Restauration comedy was the first in our trio of comedies. 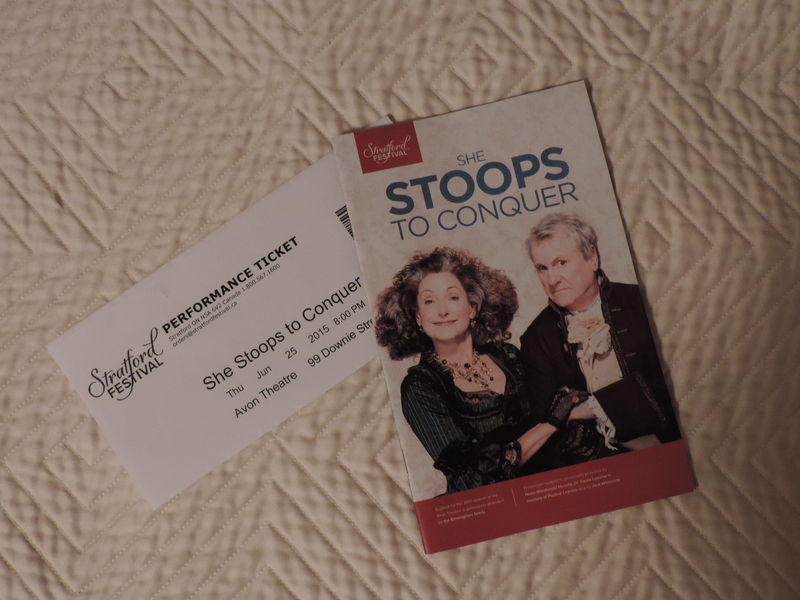 I am actually not that big a fan of the genre and often find dramatic plays funnier (see Hamlet), but this almost screwball comedy made for a nice evening of light entertainment. At least I am categorising as ‘light’, because otherwise I’d have to ask why in the world Kate Hardcastle -‘she’ of the title – would stoop to conquer such an oaf as Charles Marlow instead of throwing him out of the house for abusing her father and the staff. Anyway, let’s blame this on the time the play takes place and focus on the performance. Joseph Ziegler plays Richard Hardcastle, the head of the family who wants to marry off his daughter to his old friend’s son, brilliantly. His wife – the wonderful Lucy Peacock donning a wig Helena Bonham-Carter would be jealous of – has an issue with admitting not only her own age but also that of her son from a previous marriage and doesn’t want to let go of her niece’s jewels. Said niece (Sara Farb) wants to elope with Marlow’s (Brad Hodder) friend Hastings (Tyrone Savage), aided by her cousin Tony who otherwise would have to marry her. So far, so complicated. Marlow has an issue talking to high-born women which manifests rather hilariously for the audience. Unfortunately, when he thinks he is talking to ‘simple’ folk, he has no manners at all. Brad Hodder plays both really well and has good chemistry with Maev Beaty, who disguises herself as a barmaid in order for Marlow to be able to talk to her. There is a lot of confusion and cases of mistaken identities during the play, which caused a gentleman behind us to comment he was reminded of The Importance of Being Earnest. The rotating set pieces allowed quick changes between rooms in the Hardcastles’s house, their garden and an inn and helped keep up the pace. All in all, is was a fun but inconsequential romp. This entry was posted in Live, Reviews, Stratford Festival (Canada) and tagged André Morin, Avon Theatre, Bahia Watson, Brad Hodder, Daniel Briere, Deidre Gillard-Rowlings, Gareth Potter, Joseph Ziegler, Karack Osborn, Kevin Bundy, Lally Cadeau, Laura Schutt, Lucy Peacock, Maev Beaty, Martha Henry, Nigel Bennett, Oliver Goldsmith, Paul Rowe, Ryan Field, Sara Farb, Shannon Taylor, Stratford, Stratford Festival, Theatre, Tyrone Savage. Bookmark the permalink.